Sometimes we are so busy adding up our troubles that we forget to count our blessings! Annual picture day s Saturday & Sunday August 29th & 30th, reserve your spot soon. Kenpo Tournament Saturday Oct 3rd, Fillmore! Gus joined American Academy of Self Defense in January of 2015. Always trying his best, Gus shows a willingness to learn and remember material far beyond his years. Gus says his favorite techniques are kicks, and his round house is getting rather good. When asked if the material is too hard, Gus replies with a very loud NO SIR, willing to tackle anything that comes towards him. 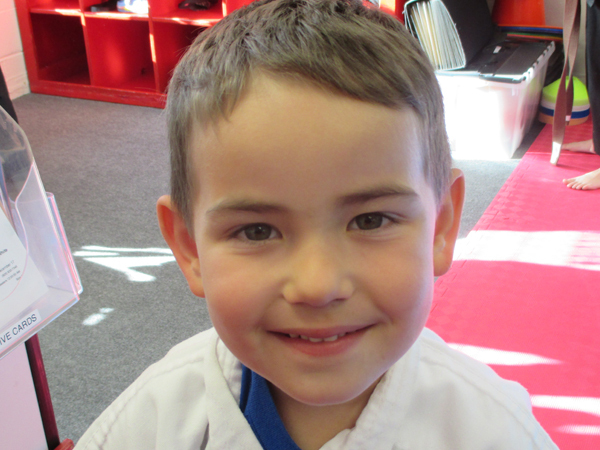 Sifu Rick & staff are very confident that Gus will make a fine Black Belt one day, not only in Martial Arts but as Black Belt in life with developing strong principles of Black Belt, which include, Honesty, Courtesy, Perseverance, and Indomitable Spirit. We also wish to salute Gus’ parents, Brandi and James for all their support, of Gus and our school. Making just a few changes in your lifestyle can help you live longer. Adopt the following six habits to keep your body looking and feeling young. Don’t Smoke. If you smoke, quitting is perhaps the single most important thing you can do to increase your health and your life span. Quitting can slow disease and increase survival odds, even in smokers who have already caused significant damage to their lungs. Turn Off the TV. Too much time in front of the television can take a serious toll on your health. One reason sedentary behavior has such a significant impact on your health is because you expend less energy when you’re sitting or lying down than when you’re on your feet, just standing or walking around. Don’t Overeat. Author Dan Buettner, who studies longevity around the world, found that the oldest Japanese people stop eating when they are feeling only about 80 percent full. When possible, try to eat before you are extremely hungry; this will help control overeating. Slow down when it’s meal time and chew your food well before swallowing. Stay Out of the Sun. Avoiding the sun can head off skin cancer, and it can also keep you looking young by preventing wrinkles, fine lines, and saggy skin. When you are going to be outside for more than 15 minutes, reach for the sunscreen (SPF of 30 or higher). Eat Fruits and Vegetables. Eat at least three servings of fruits and vegetables a day. Fruits and veggies are nutritional powerhouses filled with fiber and vitamins, and they can lower your risk of heart disease by 76 percent. They may even decrease your risk of certain cancers. Exercise. Exercise not only makes you feel great and keeps you toned, but it aids in lower blood pressure, decreasing the risk of heart attack and stroke, and trimming the chances of becoming obese or developing diabetes. In general, exercise extends longevity by diminishing the risk of a variety of different ailments. Moderate exercise, for example, a quick 30-minute walk each day, can lower your risk of heart problems. August is National Family Fun Month! Treasure hunts are a great way to get your children engaged, entertained and away from their various screens. Even though it’s relatively easy to find shortcuts online, set-up for these types of activities can be labor-intensive. Follow the steps below to create a terrific treasure hunt for your kids. Know your audience. The age and gender of the children you are preparing the hunt for definitely make a difference. As a general rule of thumb, kids will stay engaged for a set of clues equal to their age times two (for a 10-year-old, 20 clues is probably the longest you want to make your hunt). Choose a location. For kids under eight, you want to hide the clues in areas that are incredibly familiar to them, like their home or backyard. The more unfamiliar the location, the easier the clues should be. For kids 9-12, you can host the hunt at a school or park, somewhere they’ve frequently visited. For teens, you can get cooperation from area businesses, or from vendors at a fair or farmer’s market. Pick your theme. Team competitions are usually incredibly fun for teens, but absolutely stressful for young children. Again, know your audience and pick a theme that will keep them excited. Start making clues! Take pictures, write short rhymes, or look online for riddles. Use “invisible ink” (white crayon clues on white paper can be “decoded” with a highlighter), make video clues, or have hunters call cooperating family members with a “password.” Just make sure your clues are age appropriate – younger children will give up or become distracted if the clues get too tricky. Decide how to present the first clue, and where to hide the treasure. Have fun, be creative, and take lots of pictures. Happy hunting! The back-to-school season can be an exciting and anxiety filled time of year. Help ease the transition with these tips. Meet the new teacher – Breaking the ice between your child and his or her new teacher before the first day can help calm the “Will-I-like-my-new-teacher” fears. Find out when your school’s open house night is, and make plans to attend. Tour the school – Yet another good reason to attend the open-house. Your child won’t be as worried about getting lost if he or she has already walked the school with you. Connect with friends – Find out early which of your child’s classmates will be in his or her class this year. Call other parents and refresh those familiar relationships before school starts by scheduling a playdate.